This product requires the base game Sid Meier’s Civilization® V: The Complete Edition. 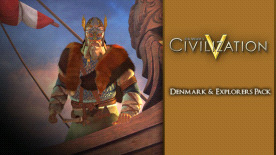 This pack contains both the Denmark Civilization & The Explorers Map Pack. Ten fantastic single-player maps make up this Civilization V DLC pack designed by Firaxis Games. Five of the maps are based on real-world locations, chosen for their historical interest and gameplay possibilities. The remaining five are scripted map environments. These maps will change from game to game, but will focus on an exciting gameplay theme. From the arid Sandstorm to the lush Amazon, and from the Caribbean to the Bering Strait, these maps will give skillful Civilization V players new lands to conquer! 1991-2010 Take-Two Interactive Software and its subsidiaries. Developed by Firaxis Games. Sid Meier's Civilization V, Civ, Civilization, 2K Games, Firaxis Games, Take-Two Interactive Software and their respective logos are all trademarks of Take-Two interactive Software, Inc. Fork Copyright © 2010 Fork Particle, Inc. Rapid XML Copyright © 2006-2010 Marcin Kalicinski. Lua Copyright © 1994-2010 Lua.org, PUC-Rio. Uses Granny Animation. Copyright © 1999-2010 by RAD Game Tools, Inc. Uses Miles Sound System. Copyright © 1991-2010 by RAD Game Tools, Inc. The ratings icon is a trademark of the Entertainment Software Association. All other marks and trademarks are the property of their respective owners. All rights reserved. The content of this videogame is fictional and is not intended to represent or depict an actual record of the events, persons or entities in the game's historical setting. Product offered subject to your acceptance of the 2K Games License (see in game manual and at www.take2games.com/eula) and Steam Subscriber Agreement (SSA). You must activate this product via the Internet by registering for a Steam account and accepting the SSA. Please see www.steampowered.com/agreement to view the SSA prior to purchase. If you do not agree with the provisions of the 2K Games License or SSA, in accordance with our returns policy, you should not buy this game. Non-transferable access to special features such as exclusive, unlockable, downloadable or online content, services, or functions may require single-use serial code, additional fee and/or online account registration (13+). Access to special features may require internet connection, may not be available to all users, and may, upon 30 days notice, be terminated, modified or offered under different terms. Civilization V is required to play this DLC.